Hollington United will face Sidley United in the Hastings & District FA Intermediate Cup final. Both teams achieved 1-0 away wins in their semi-finals yesterday (Wednesday), Hollington edging out Battle Baptists and Sidley overcoming St Leonards Social. Bexhill Town and Crowhurst tussle for possession at Bexhill Road. Those were two of six matches involving Macron East Sussex Football League clubs to take place on a glorious spring evening. Division One high-flyers Bexhill AAC won 3-2 at home to Division Two promotion hopefuls Icklesham Casuals in a Hastings & District FA Junior Cup semi-final. Robertsbridge United prevailed by the same score at home to Premier Division rivals Rye Town at the same stage of the Robertsbridge Charity Intermediate Cup. The Robertsbridge Charity Junior Cup semi-final between West Hill United and Hollington United II wasn’t played due to the absence of pitch lines. 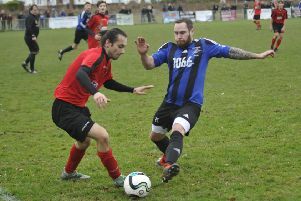 Crowhurst on the ball during their 4-3 defeat to Bexhill Town. Bexhill Town moved up two places to sixth in the Premier Division courtesy of a 4-3 victory at home to Crowhurst. Northiam 75 II won 3-2 away to Icklesham Casuals II in Division Five. Orington were victorious in the second of the league’s cup finals on Monday night. The Division Four leaders lifted the Coopers Construction Challenge Cup after edging out Division Five top dogs Hampden Park 3-2 at The Pilot Field, home of Hastings United FC. A Bexhill Town player passes the ball forward against Crowhurst. The third final will take place next Monday when Premier Division side Rye Town will face Division One pacesetters Northiam 75 in the Premier Travel Challenge Cup decider. Kick-off is 7.30pm. Rye booked their place by inflicting a first defeat of the season on Premier Division leaders Hollington United in Saturday’s semi-final. Rob Levett’s second half double earned Rye a 2-1 victory over a Hollington side which equalised through an own goal shortly after having a man sent-off. As for the rest of Saturday’s action, Battle Baptists closed to within a point of Hollington in the Premier Division title race courtesy of a 3-0 win at home to Ore Athletic. Goals from Tom Saunders, Ollie Jeffs and Josh Pickering sunk an Ore team which is now guaranteed to finish in the bottom two. Rock-bottom Crowhurst claimed their first league win of the season with a 1-0 victory in the second game of a double header against St Leonards Social having lost the first by the same score. Greg Bennett scored Social’s winner in the first game and Gary Croft did the same for Crowhurst in the second match. Scott Embery plundered a four-goal salvo as Northiam 75 won 5-0 away to Mountfield United in Division One. Andrew Maplesden got the other goal. Second-placed Westfield II ended their campaign with a 0-0 draw at home to Wadhurst United, who dropped two places to fifth. Bexhill AAC rose to third - 11 points behind leaders Northiam with five games in hand - on the back of a 8-0 victory at home to Rock-a-Nore. Jack Buckley helped himself to four of the goals, Craig Ray bagged a brace, and there was one apiece for Andy Atkin and Darren Witham. The JC Tackleway are up to fourth following a 7-0 success at home to Hastings Rangers. Jordan Harley netted a hat-trick, and Josh Eaton, Toby Shaw, Mark Chandler and Callum Fisher chipped in with one each. It was a dramatic afternoon in Division Two as all of the leading three clubs tasted defeat. Top-of-the-table Bexhill United II completed their programme with a 7-0 defeat away to seventh-placed Mayfield, for whom Glen Wooden netted four goals, Simon Betteridge two and Callum Matthews one. Sovereign Saints moved up to second - three points behind Bexhill with four matches left - after recording a win and a loss in a double header against sixth-placed Peche Hill Select. Saints won the first game 1-0, but lost the second 3-1 as Ryan Rankin struck twice and Benjamin Symes once for Peche Hill. Wisdens Sports Challenge Cup winners Icklesham Casuals completed a busy week with a 2-0 reverse away to Hollington United II which dropped them to third - a point behind Saints having played the same amount of fixtures. Jan Bailey scored both goals for fourth-placed Hollington, who are now just three points behind Icklesham with a game in hand. Fifth-placed St Leonards Social II won 3-2 at home to second-bottom Wittersham via the finishing of Tyrone Lukun (2) and Ashley McCann. The JC Tackleway climbed to third in Division Three courtesy of a 6-0 win at home to third-bottom Magham Down. Toby Shaw grabbed four of the goals, and Chris Aldous and Adam Hull got the others as Tackleway almost matched their first team’s 7-0 success immediately beforehand. Sixth-placed Catsfield stayed within three points of Tackleway by winning 2-0 at home to bottom-of-the-table Ticehurst. Seventh-placed Victoria Baptists completed their fixtures in style with a 5-1 triumph away to second-bottom Hawkhurst United II. Thomas Macdonald (2), Danny Bunn, Gary Walke and Lawrence Green scored for the Hawks, while Danny Lawrence nabbed Victoria’s consolation. It could well have been a significant day in the Division Four title battle because leaders Orington were beaten 5-1 away to South Coast Athletico and second-placed Bexhill AAC II won 6-1 at home to Parkfield. Jack Bloomfield (2), Ryan Wright, Dayle McGurk and Connor Easton struck for fourth-placed Athletico against an Orington side which had its cup final two days later. AAC are now just two points behind Orington with two games in hand after four goals from Matt Simmons, and one apiece by Ashley Carey and Dominic Sinden took them past second-bottom Parkfield, whose consolation was netted by Ryan Ecclestone. Third-placed Bexhill Broncos are two points behind AAC having played an extra match. They were awarded the points for their scheduled fixture away to bottom side Burwash. Fifth-placed Sovereign Saints II won 4-3 at home to sixth-placed Cranbrook Town in a seven-goal thriller. Sedlescombe Rangers III were knocked off the top of Division Five following a 2-1 defeat away to Robertsbridge United II. Strikes by Michael Stone and Daniel Goodsell won it for fifth-placed Robertsbridge. Liam Jeffery netted for Sedlescombe. Hampden Park are the new leaders on the back of a 4-0 victory at home to an AFC Hollington side which has dropped to the foot of the table. Chris Puttick (2), Eddie Dunn and William Coles got the goals in a game which produced one red card for Hampden Park and two for Hollington. Hampden Park are a point clear of Sedlescombe and one win from their final three fixtures will secure the title. Beckley Rangers jumped two places off the bottom by virtue of a 5-2 success away to sixth-placed Wittersham II. Joe Maylam scored a hat-trick, and Luke Townsend and Ole Jurgensen also hit the net as Beckley celebrated back-to-back wins. West Hill United II also climbed above Hollington with a 2-2 draw at home to seventh-placed Herstmonceux II. The goals of Aiden Pierce and Tommy Warren for West Hill were matched by Ryan Bennett and Waylon Smith for Herstmonceux. Northiam 75 II pulled off a splendid 3-2 victory at home to higher grade West Hill United to reach the Hastings & District FA Lower Divisions Cup final. Tom Powell bagged a brace and Brendon Doughty also struck for Division Five side Northiam, while Daniel Wilkes and Matthew Wheeler notched for Division Four outfit West Hill. Northiam will take on Cranbrook Town in the final. The day’s other cup game produced a very good 2-0 victory for Division Three runners-up Sedlescombe Rangers II away to champions Punnetts Town in a Robertsbridge Charity Junior Cup semi-final. Liam Baker’s double put Sedlescombe through to the final, where they will play West Hill United or Hollington United II.